In Eastern Orthodox Christian theology, the Tabor Light (Ancient Greek: Φῶς του Θαβώρ "Light of Tabor", or Ἄκτιστον Φῶς "Uncreated Light", Θεῖον Φῶς "Divine Light"; Russian: Фаворский свет "Taboric Light") is the light revealed on Mount Tabor at the Transfiguration of Jesus, identified with the light seen by Paul at his conversion. The view was very controversial when it was first proposed, sparking the Hesychast controversy, and the Palamist faction prevailed only after the military victory of John VI Kantakouzenos in the Byzantine civil war of 1341–1347. Since 1347, it has been the official doctrine in Eastern Orthodoxy, while it remains without explicit affirmation or denial by the Roman Catholic Church. Roman Catholic theologians have rejected it in the past,[year needed] but the Roman Catholic view has tended be more favourable since the later 20th century. Several Western scholars have presented Palamism as compatible with Roman Catholic doctrine. In particular, Pope John Paul II in 1996 spoke favourably of hesychast spirituality, and in 2002 he named the Transfiguration as the fourth Luminous Mystery of the Holy Rosary. 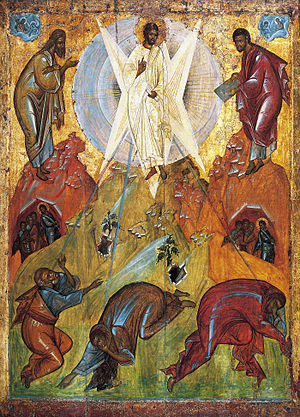 According to the Hesychast mystic tradition of Eastern Orthodox spirituality, a completely purified saint who has attained divine union experiences the vision of divine radiance that is the same 'light' that was manifested to Jesus' disciples on Mount Tabor at the Transfiguration. This experience is referred to as theoria. Barlaam (and Western Christianity's interpretation of apophaticism being the absence of God rather than the unknowability of God) held this view of the hesychasts to be polytheistic inasmuch as it seemed to postulate two eternal substances, a visible (the divine energies) and an invisible (the divine ousia or essence). Seco and Maspero assert that the Palamite doctrine of the uncreated light is rooted in Palamas' reading of Gregory of Nyssa. Gregory Palamas defended Hesychasm in the 1340s at three different synods in Constantinople, and he also wrote a number of works in its defense. In these works, Gregory Palamas uses a distinction, already found in the 4th century in the works of the Cappadocian Fathers, between the energies or operations (Gr. energeies) of God and the essence (ousia) of God. Gregory taught that the energies or operations of God were uncreated. He taught that the essence of God can never be known by his creatures even in the next life, but that his uncreated energies or operations can be known both in this life and in the next, and can convey to the Hesychast in this life and to the righteous in the next life as a true spiritual knowledge of God (theoria). In Palamite theology, it is the uncreated energies of God that illumine the Hesychast who has been vouchsafed an experience of the Uncreated Light. Roman Catholic pro-ecumenism under John Paul II from the 1980s sought for common ground in questions of doctrinal division between the Eastern and the Western Church. John Paul II repeatedly emphasized his respect for Eastern theology as an enrichment for the whole Church, and spoke favourably of Hesychasm. In 2002, he also named the Transfiguration as the fourth Luminous Mystery of the Holy Rosary. The Eastern doctrine of "uncreated light" has not been officially accepted in the Roman Catholic Church, which likewise has not officially condemned it. Increasing parts of the Western Church consider Gregory Palamas a saint, even if uncanonized. "Several Western scholars contend that the teaching of St. Gregory Palamas himself is compatible with Roman Catholic thought on the matter." At the same time, anti-ecumenical currents within Eastern Orthodoxy presented the Tabor Light doctrine as a major dogmatic division between the Eastern and the Western Church, with the Hesychast movement even described as "a direct condemnation of Papism". "Tabor Light" was also used in the popular press of 1938 in reference to a mysterious light seen around a cemetery named "Tabor" near Esterhazy, Saskatchewan, Canada. ^ "the Western world has started to rediscover what amounts to a lost tradition. Hesychasm, which was never anything close to a scholar's pursuit, is now studied by Western theologians who are astounded by the profound thought and spirituality of late Byzantium." Metamorphosis: The Transfiguration in Byzantine Theology and Iconography (St Vladimir's Seminary Press 2005, ISBN 0-88141-295-3), pp. 215-216. ^ a b "Pope John Paul II 11 August 1996 Angelus". www.ewtn.com. Retrieved 2018-01-09. ^ a b Original text (in Italian) Speaking of the hesychast controversy, Pope John Paul II said the term "hesychasm" refers to a practice of prayer marked by deep tranquillity of the spirit intent on contemplating God unceasingly by invoking the name of Jesus. While from a Catholic viewpoint there have been tensions concerning some developments of the practice, the Pope said, there is no denying the goodness of the intention that inspired its defence, which was to stress that man is offered the concrete possibility of uniting himself in his inner heart with God in that profound union of grace known as Theosis, divinization. ^ a b The "Luminous Mysteries", published in Rosarium Virginis Mariae, October 2002. ^ Seco, Lucas F. Mateo; Maspero, Giulio (2009). The Brill Dictionary of Gregory of Nyssa. Brill. p. 382. ^ PARADISE AND HELL IN THE ORTHODOX TRADITION by Fr. George Mmetallinos, Orthodox Heritage, Vol. 07, Issue 03-04 March–April 2009. ^ Christensen, Jo-Anne (1995). Ghost Stories of Saskatchewan. Dundurn. p. 104. ISBN 9780888821775. Andreas Andreopoulos, Metamorphosis: The Transfiguration in Byzantine Theology and Iconography SVS Press, 2005 (ISBN 0-88141-295-3). This page was last edited on 17 August 2018, at 00:55 (UTC).